A friend came over for a 2 player session just the other day. He left his money clip at my place and came to pick it up. How come girls don't do that when they come over to my place? Leave stuff so they can come back. Bleh. Anyway, my friend is a very big fan of Hanabi. He's kinda obsessed about it actually. So much so that he told me that he recently added "getting a perfect score of 25 in Hanabi" this bucket list. Talk about dedication! Was supposed to have a group of just 3 of us but a 4th came along somewhat uninvited but no real issue there. 3 or 4 is really my favorite number of players. 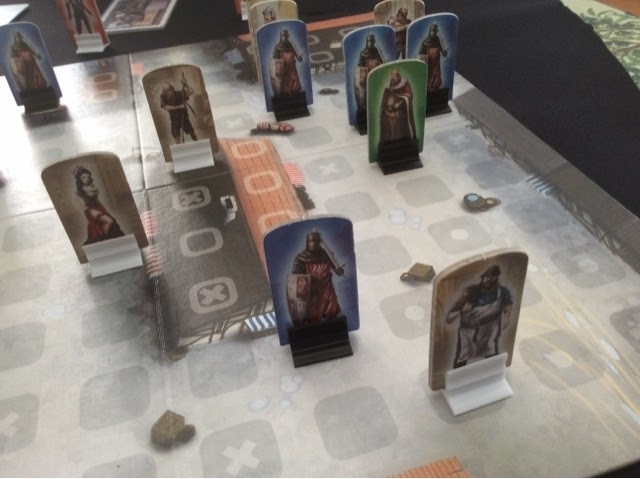 We had the opportunity to interview Rob regarding Risk Legacy and his upcoming Seafall. So many wonderful games have been designed in Japan or re-printed with some fantastic components, I wanted to share with everyone some of the games I've come across while living in Japan. So here's the start to a new article series called : "Games that made me buy them - in Japan". Every time I browsed the Japanese game stores for Japanese games, this game Mogul by Michael Schacht (oroginally published in 2002) would appear and draw me to it with it's eye catching art. 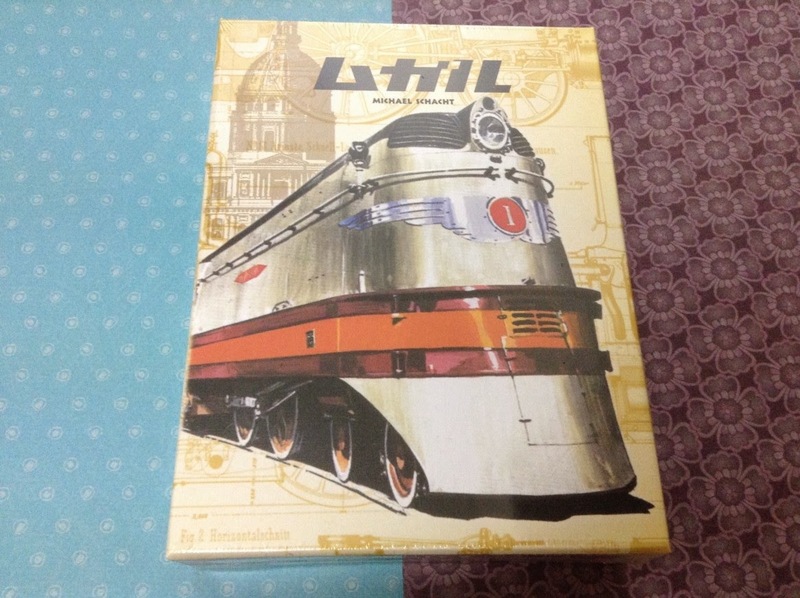 I'm not a big fan of the train theme but once I've played a train game and enjoy it I usually will continue to enjoy it (I do own Ticket to Ride and Trains, which are both games I bought after 0 plays). Not knowing much about this game, and seeing that it was a train game, I would look at the title and try to work out what the Japanese game page said and the price, then bypassed it, but I filed it away in my brain to check it out again at a later stage. 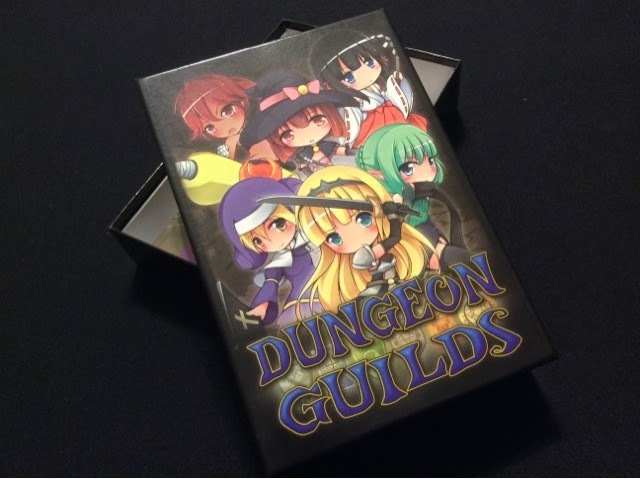 After several months of seeing this game at online game stores, I finally decided to do a bit of research on BGG by reading the comments written by gamers....and it was an INSTANT buy! I received the Japanese version of Mogul (published by Gamefield in 2013) a couple of days ago, as soon as I picked up the box, I thought this is definitely worth the price listed. I finally opened it up just to take some happy snaps for this page, and was blown away by the fantastic components! 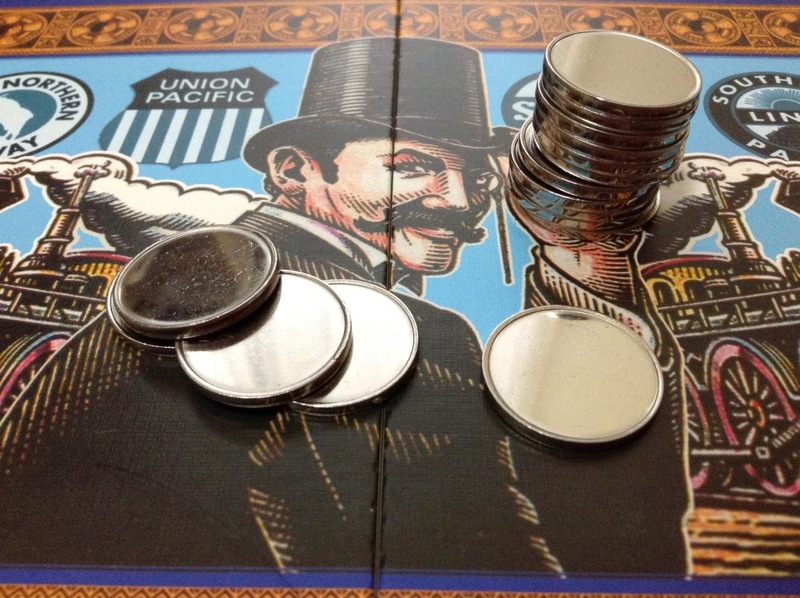 The cards are of linen stock, and the AMAZING coins...are amazing!!! I'm not sure if these are similar coins to the ones they use in Kobayakawa by Oink Games, but they are awesome. If you like train games, or have been wanting to get a cool edition of Mogul, I would recommend getting the Japanese edition of Mogul. I haven't seen the components of the other editions, but I think Gamefield did a spectacular job with this edition. I can't wait to give this a go. 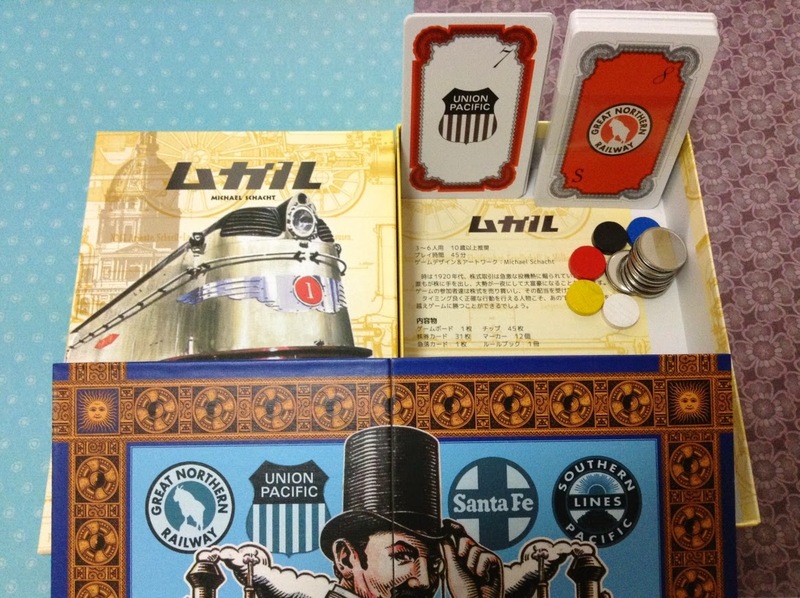 This version only has Japanese rules, but the cards and the board have English text. 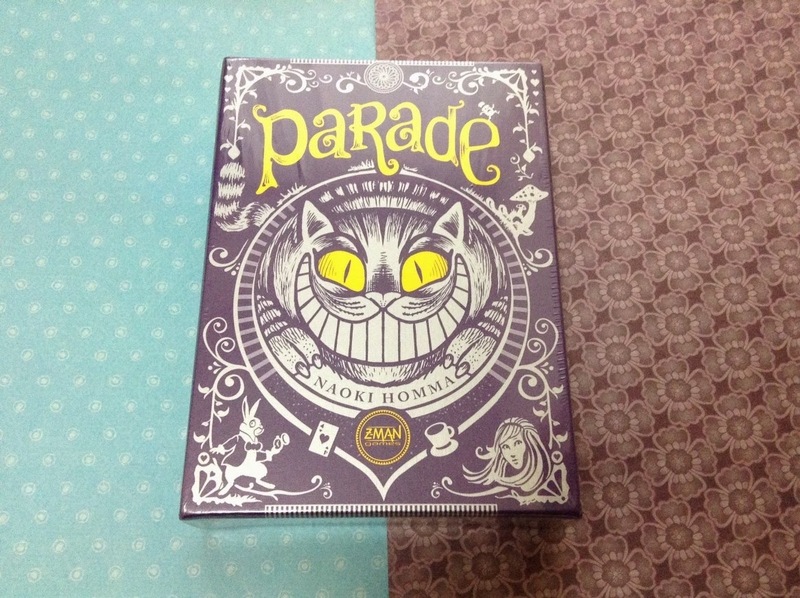 At the end of last year, a friend Mike introduced me to a small card game called Parade by Naoki Honma (published in 2007). The game was originally designed and published in Japan, then Z-man games picked it up. Mike had the Z-man games version. After 1 play, I knew I had to buy this. The game reminded me a little of Guillotine by Paul Peterson, because the cards are laid out in a line, but that's where the similarities end. In Guillotine you are trying to collect cards, but in Parade you are trying not to collect any cards. If you collect cards they are worth the card value but in negative points, but if you can collect the majority of a colour then each card is only worth 1 negative point instead of their card value. I instantly fell in love with this game, and hearing that it was a bit hard to find...made me want it even more. A month or so later, they released the newer version in 2013, with a wonderfully designed box cover. It took me several months to finally get a copy of this game, and I have no regrets in buying this beautifully designed version. 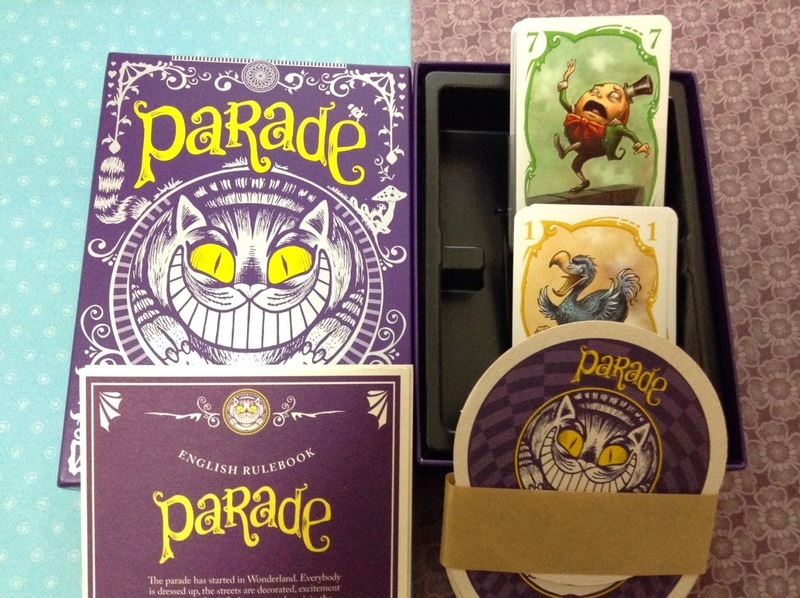 This version comes with the cards which has updated art, and as an added bonus - it comes with some cool Parade coasters with the Cheshire cat on each one (I think I won't be able to bear to use these coasters). If you want a game that looks amazing, plays 2-6 players and is fun, give Parade a go. The new "blue box" version should be available at most game stores. It comes with English & French rules. To commemorate Eric's departure from the world, I mean, from Singapore, haha :P , I held a games day at my place for a group of somewhat newbies. They have played at my place once ( possibly twice ) before, but that must have been in a span of within a year perhaps. Labels: Castles of Burgundy, Coconuts, dungeon guilds, Dungeon of Mandom, Gringo, little prince, origin, super rhino, Sushi Go! Push Your Luck Podcast Episode 32: Would you like some tea ? Hi all! Episode 32 is LIVE! I interview the organiser of a local event aimed at bringing more ladies into boardgaming (which was coincidentally held on Valentine's day :P ). Also interviewed an attendee who helped out as a butler. Find out all this and more in our episode! Go to iTunes and search for Push your Luck podcast, subscribe, review and rate us!